FAW Toyota, a joint venture between Toyota Motor Company and First Automobile Works, has launched a flagship store on JD.com, China’s largest retailer, allowing customers in China to purchase and schedule maintenance services online and then bring their vehicles to FAW Toyota’s offline service centers at their convenience. In addition to auto services, customers can easily purchase a variety of automobile parts and related products. After making their online purchases, customers will receive a verification code on their phones, which they can use at FAW Toyota’s offline ‘4S’ stores to redeem their parts, supplies, installation or repair services. Auto parts and supplies can also be delivered directly to customers’ homes. Apart from the new levels of convenience customers will enjoy, both companies also will benefit from major synergies created by the new partnership. FAW Toyota will receive invaluable insights from JD provided by the e-commerce platform’s big data on auto consumers, such as the age, gender, and purchasing behavior of shoppers among its more than 300 million active customers. For JD, the strategic cooperation strengthens its position as the go-to e-commerce destination for an ever-expanding range of products and services. “In addition to making it easier for more Toyota owners to find and do business with us, JD offers us unmatched access and insights into the Chinese market,” said Zhenguo Liu, VP of FAW-TOYOTA Motor Sale Co., Ltd.
As one of the latest applications of its “Boundaryless Retail” strategy, last month JD launched a new offline automotive initiative called JD Auto Service, known in Chinese as Jingdong Jingche Hui. The initiative already includes nearly 200 third-party offline car repair stores. Through JD Auto Service, customers can buy auto parts or maintenance services on JD.com, and then go to a JD Auto Service location for installation. To ensure high-quality service, each of the offline stores is screened to meet JD’s strict standards before joining the network. “We are delighted to expand the choices for China’s vehicle owners by welcoming FAW Toyota to JD.com,” said Yishen Tang, General Manager of JD’s auto accessories department. JD has been leveraging its advanced e-commerce capabilities and offline resources to expand into China’s booming automotive aftermarket business. The company’s omnichannel model now covers the entire purchasing process for car parts and services. JD currently has partnerships with over 30,000 authorized offline auto stores for complementary service. 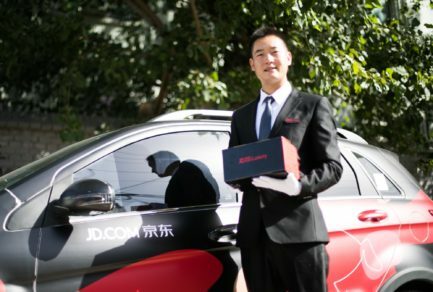 Chinese car owners have responded enthusiastically to JD’s omnichannel network, recognizing the convenience and peace of mind that its seamless solutions offer.